We generally keep Dirona ready to go to sea at a moment’s notice, and securing the cockpit furniture is typically all we need to do as we get underway. 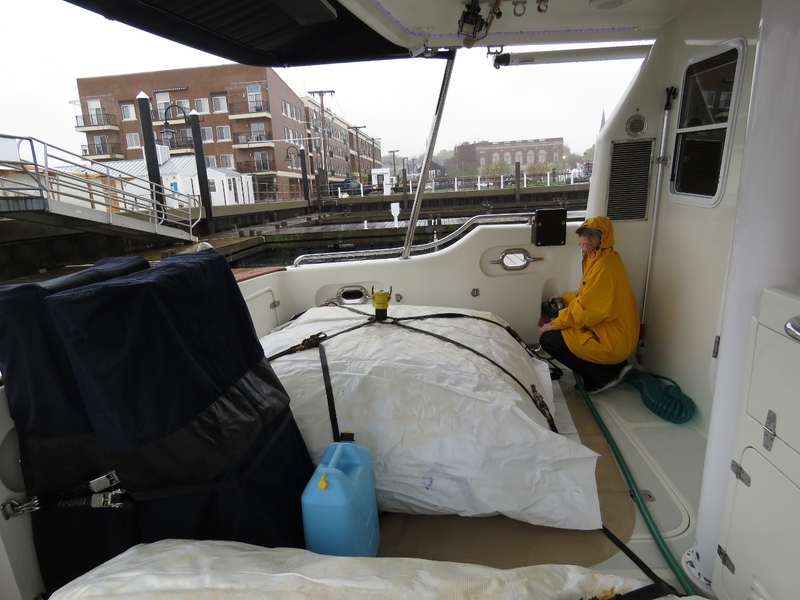 For multi-day passages, we do some additional preparation ranging from provisioning, to heavy weather preparation, to paperwork necessary to bring Spitfire into a new country. 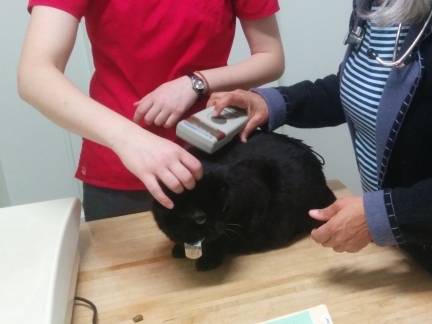 Spitfire having his microchips scanned at Kitty Corner Cat Clinic in preparation for his EU health certificate. 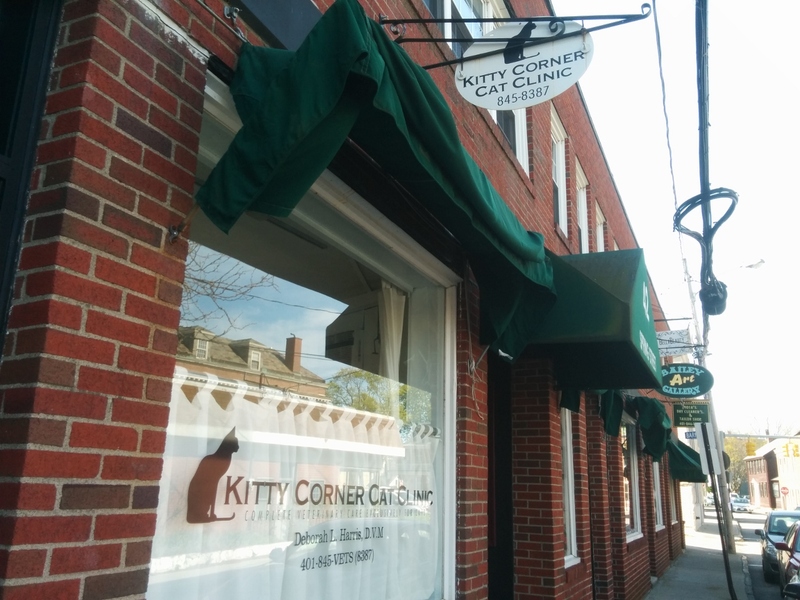 Bringing a cat into the EU from the US generally is straightforward, the only problem we have is the health certificate is valid for only ten days after it is prepared (plus the duration of the journey at sea), and must be couriered to the USDA in Albany, NY for endorsement. So we need to time its preparation for when we plan to leave. The certificate only needs to show proof of rabies vaccination, so once the vet has scanned Spitfire’s microchips and sighted the original rabies vaccination certificates, they can prepare the certificate without seeing him again. 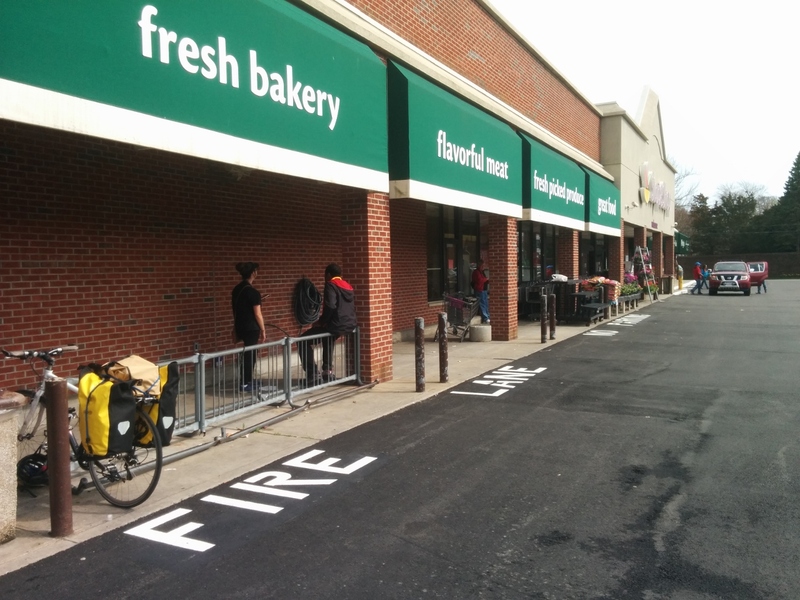 Jennifer making a bicycle shopping trip to Stop & Shop as part of provisioning for the upcoming crossing. 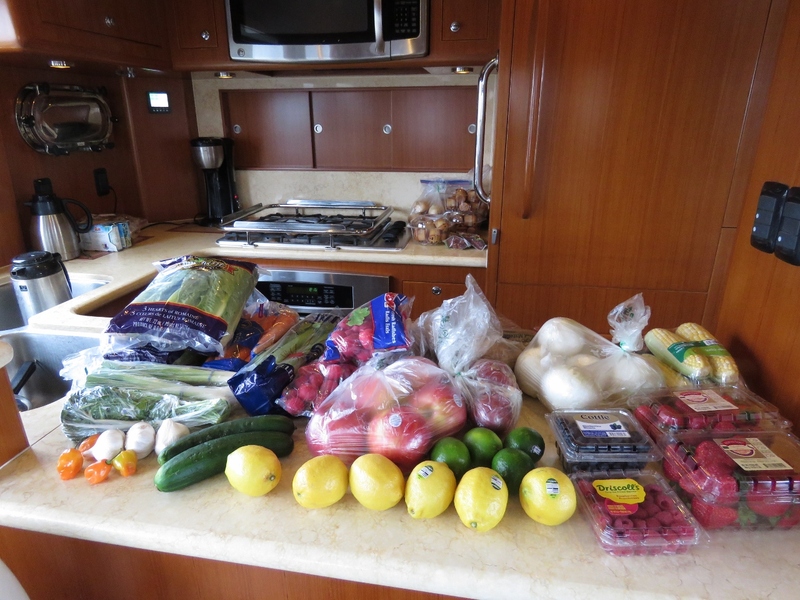 This trip is a little more challenging to provision for in that we can’t bring any meat into the EU, so we need to be careful to have enough on board that we don’t run out on passage, but not so much that we have to throw a lot away on arrival. We placed a grocery order through Peapod for non-perishables on our list. 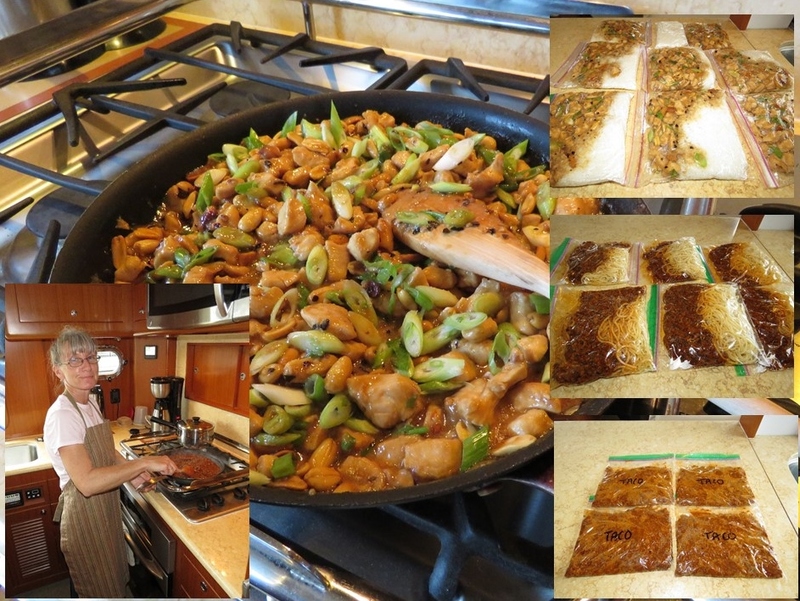 Jennifer cooked several dishes to freeze into portions for the upcoming three-week Atlantic crossing. We generally cook regular meals while at sea, but when conditions are rough or we’ve gotten busy with something, it’s nice to have a quick and hearty meal available. We’re expecting that the Atlantic crossing might be a little rougher than other passages, so we want to have a little more than usual. We’ve been studying the weather patterns and testing various departure scenarios. Conditions are certainly settling down out in the Atlantic, but not yet enough for a crossing. 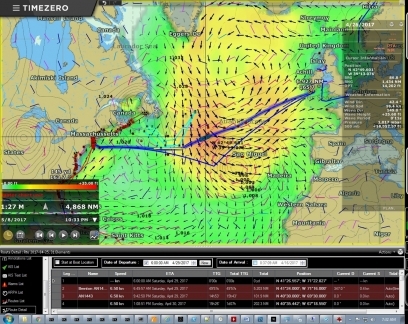 One tool we use is the weather modelling support of TimeZero, our PC-based chartplotter softwared. Using downloaded weather data that includes wind speed, barometric pressure, and wave height, period and direction, we can play our progress forward on our intended route and see what the models show for a given time and location. 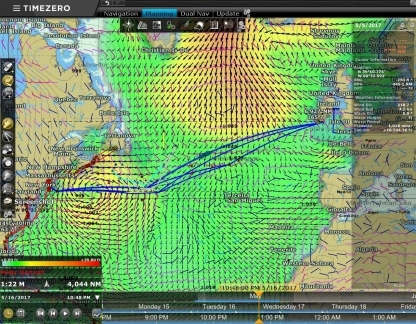 See MaxSea Grib Visualization for an example. This screenshot shows the expected conditions midway through the trip if we leave on April 29th. On May 9th, where the blue boat icon is, the seas are expected to be 26ft seas on 11 seconds—definitely not something we want to experience. Weather data isn’t really accurate much beyond five days, so conditions could improve (or worsen), but it does not look good for a crossing. The final stage of getting our new laptops up and running was to install and test the Iridium AxcessPoint Mail & Web software. 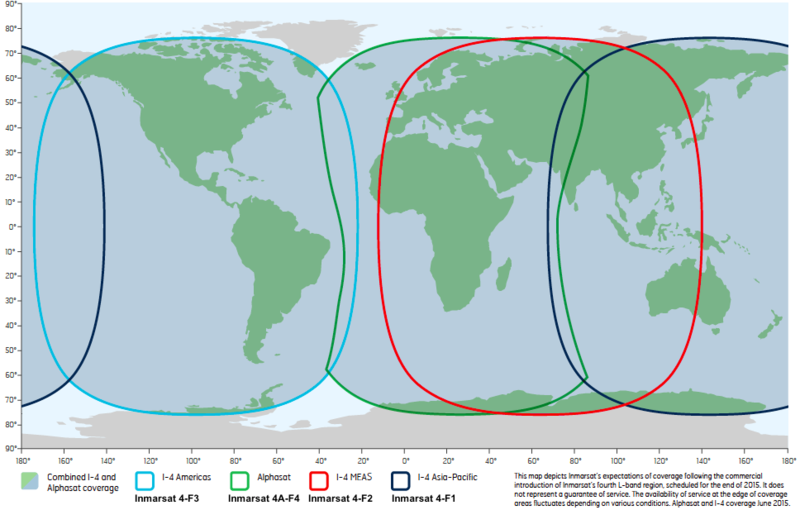 This is our second level of backup for satellite data, and we’d only use it of both our primary KVH V7-IP mini-VSAT system and secondary BGAN system were unavailable. 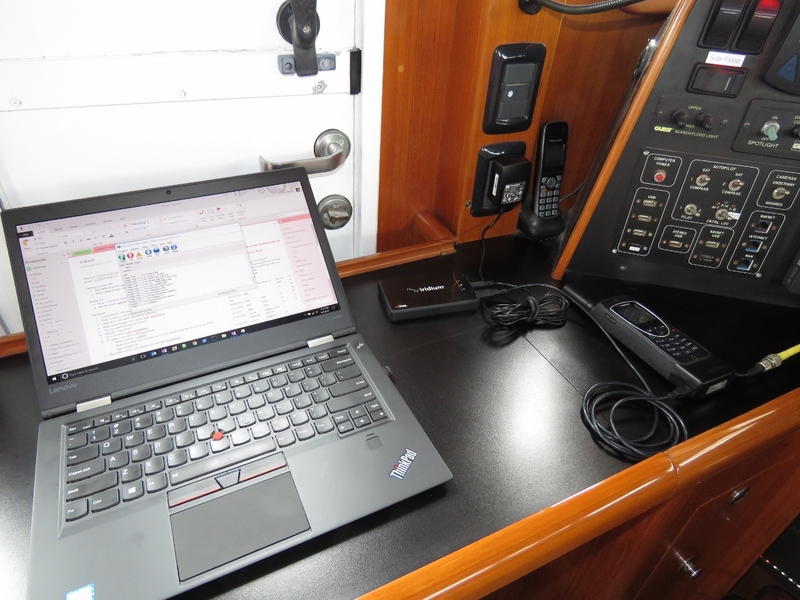 Unlike our trip across the South Pacific, Indian and southern Atlantic oceans over the past four years, we don’t expect to leave the V7-IP coverage area for most of our time in Europe. You have to go a long way north to leave the mini-VSAT coverage area. While it’s not that likely, if we decided to visit Svalbard, between mainland Norway and the North Pole, we would be out of the coverage areas for both BGAN and mini-VSAT. This would leave with coverage from Iridium only. In all of our boating thus far, we’ve never left the BGAN coverage area. 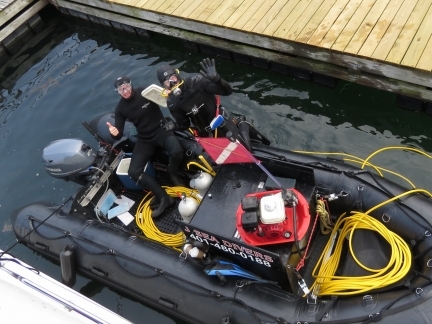 J Sea Divers arrived today to give the bottom a clean in preparation for our Atlantic crossing. 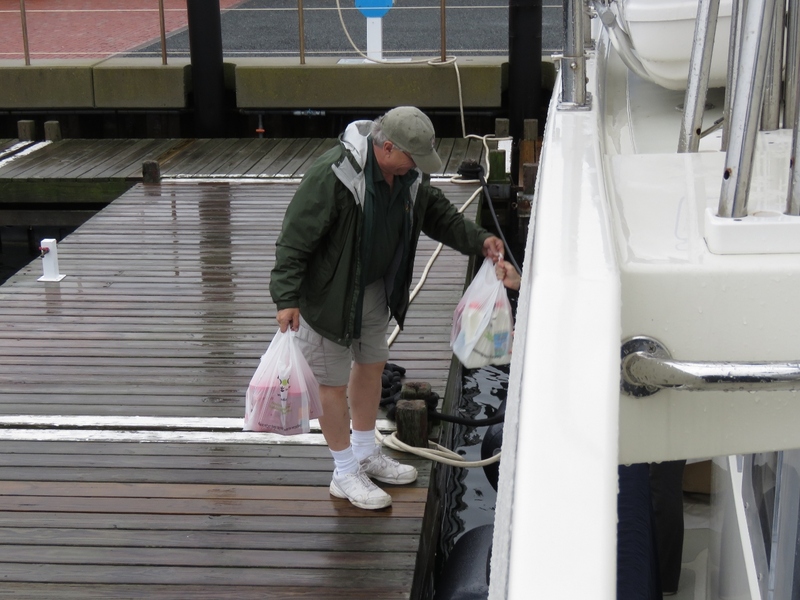 They did a great job in the chilly 55°F (13°) Newport waters. 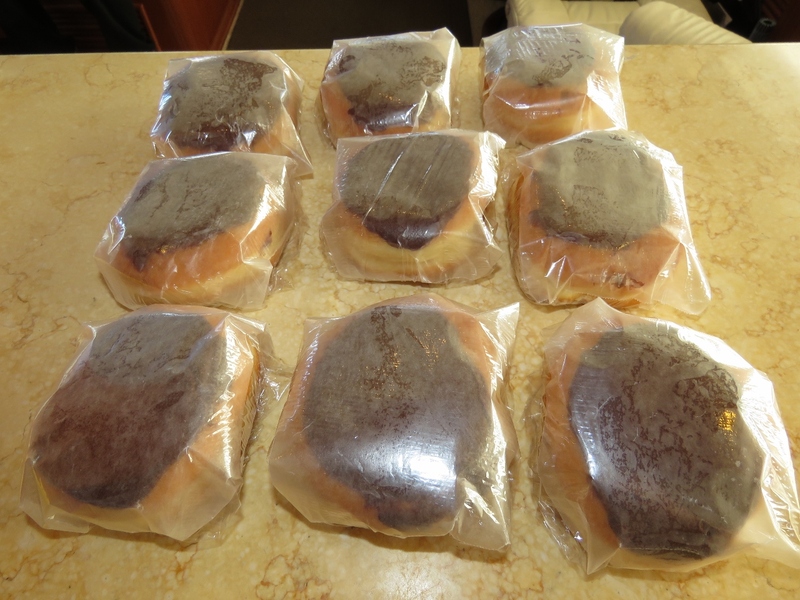 Through experimentation, we’ve learned that Boston Creme donuts do freeze well. And, more importantly, they thaw well too. 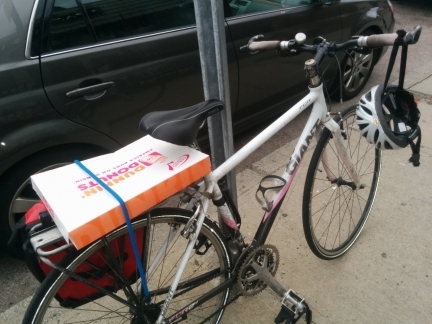 We bought a dozen to freeze for the Atlantic run. Nothing smooths rough seas like a creme-filled donut. We bought another dozen donuts this morning to help calm those rough seas. Not all made it to the freezer though. 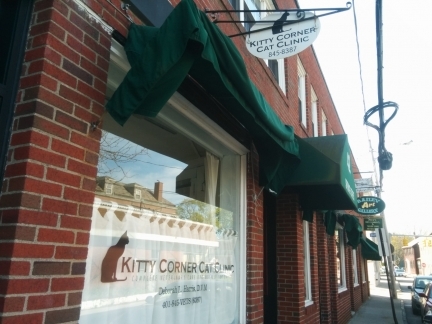 At Kitty Corner Cat Clinic to pickup Spitfire’s EU health certificate that just arrived this morning from Albany, NY with USDA endorsement. We have almost everything we need to leave for Ireland, all that’s left is a load of diesel and a quick grocery store trip. Conditions rarely are perfect in the North Atlantic, but we’ve got what looks like a reasonable weather window opening up late tomorrow after the leading edge of a low pressure system passes the area. Another small low pressure system is expected to pass us about 3-4 days out, but it doesn’t look very intense. Two large and deep low-pressure systems will be forming in the Atlantic as we are underway, but both look to dissipate and move eastward before we reach their position. And it looks like we’ve got a blocking high forming at the 500mb level that hopefully will keep low pressure systems along the US Atlantic seaboard from moving eastward on the second half of the passage. It won’t likely be a smooth passage, but it should be a safe one. The current ice limit, shown in turquoise, has suprisingly moved north of where it was a week ago (earlier limits shown in grey), so we’ve been experimenting with different routings that take us further north. 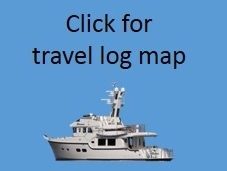 If we take the route the boat is currently shown on, we’d have a total distance of 2814nm from Rhode Island Sound to Kinsale Head, compared to 2,888nm with the most southerly of the four routes. While shorter, the nothern route does look to be just slightly more rough from a weather perspective. Large expanses of glass are great for views, but may not be strong enough for survival conditions. Storm plates fit over large windows to protect them. 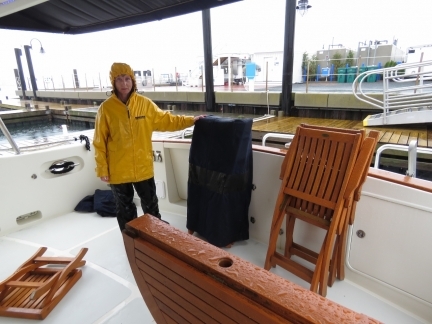 Rugged storm-capable boats really have only two options: very small, very thick windows, or larger windows that need protection at sea. Smaller windows make the boat less livable, and given the frequency of being at sea and the ease in which storm plates can be installed, the latter approach used by Nordhavn works quite well. We only use storm plates when we are going to be at sea for longer than the reliable forecast period or we have some reason to head out into forecast rough conditions. Here James is installing the storm plates on the starboard windows. For longer passages, we plug the furnace exhaust to prevent seas from forcing water through the exhaust and into the furnace boiler. There is no walkway down the port side of the boat so installing the storm plates requires putting the boat up against the dock on that side. 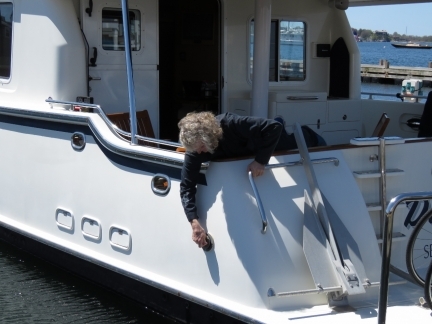 Another approach we sometimes use is to do them from the tender but the plates are large enough and the window tops high enough above the water that this isn’t simple task. 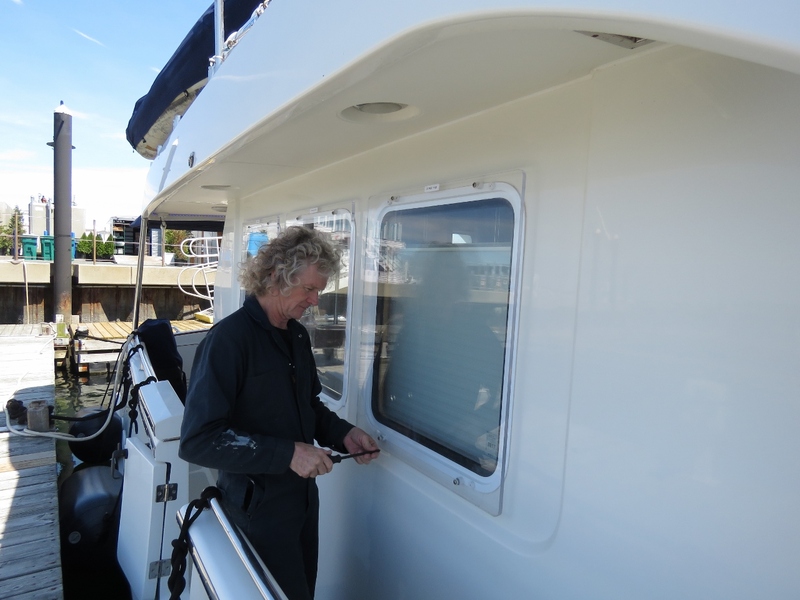 Today we lowered the tender using the crane down to the window height with the storm plates in the tender. 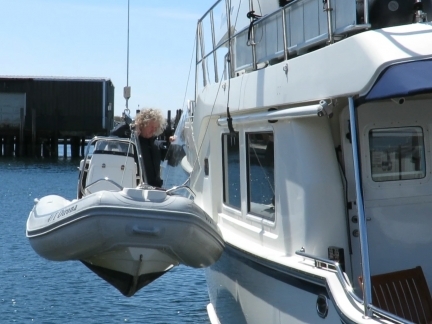 From there it’s a breeze to climb down and install the plates using the tender as a working platform a yard above the water. A final produce shop as we prepare to get underway this weekend. James carrying the bikes up to stow on the fly bridge. 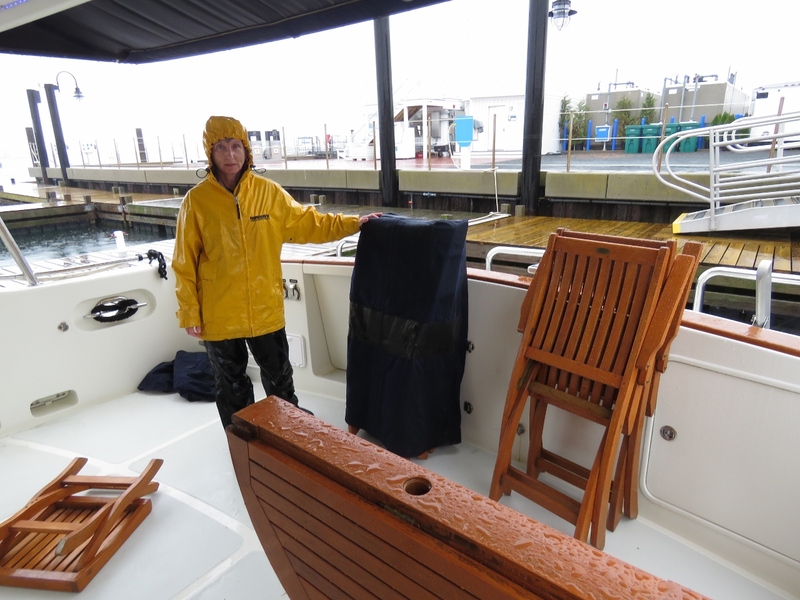 Folding the deck furniture to make space for the bladders. That low pressure system we’ve waiting to pass through before we leave is bringing heavy rains. 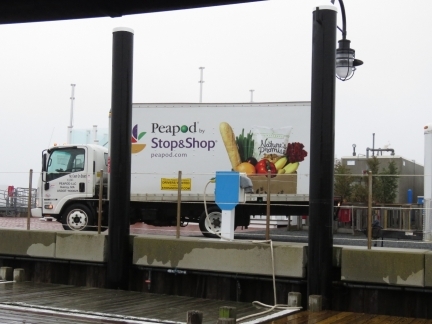 A final delivery from Peapod of some heavier perishables. We took on 2,074 gallons of fuel today and, with 976 gallons in the bladders, are carrying 2,714 gallons or 16,000lbs of diesel. The boat is several inches lower in the water. Any idea what your mile per gallon is on the wing? The wing engine is a simple, non turbo, non-intercooled, mechanically injected diesel so figure roughly 17 hp per gallon per hour whereas the main engine is 20 hp per gallon per hour. Full throttle on the wing engine is 40hp and max continuous duty output is 30 hp so the burn will be somewhere between 1.75 gph and 2.3 gph. 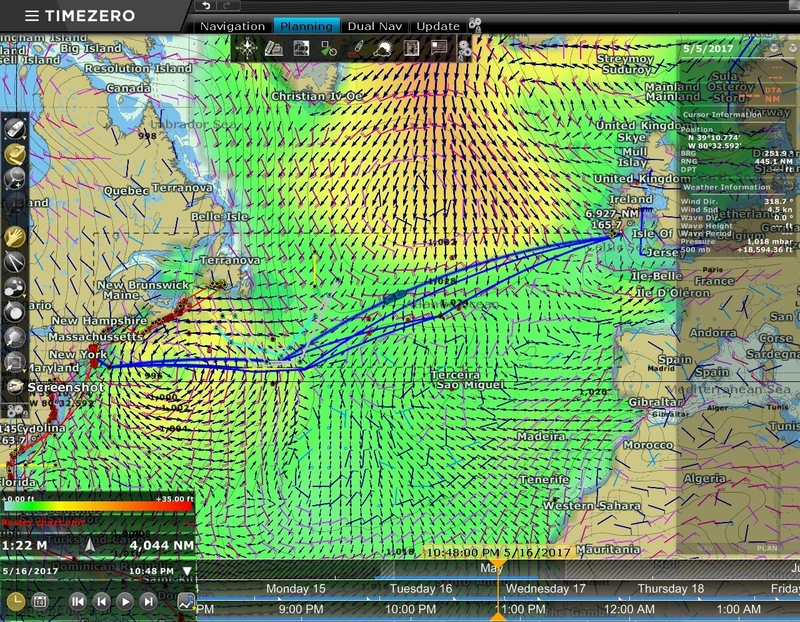 We were doing roughly 4 kts so figure somewhere between 1.7 nm/g and 2.2 nm/g. Hi, two easy ones for you…first what are the storm plates made of?…Lexan? 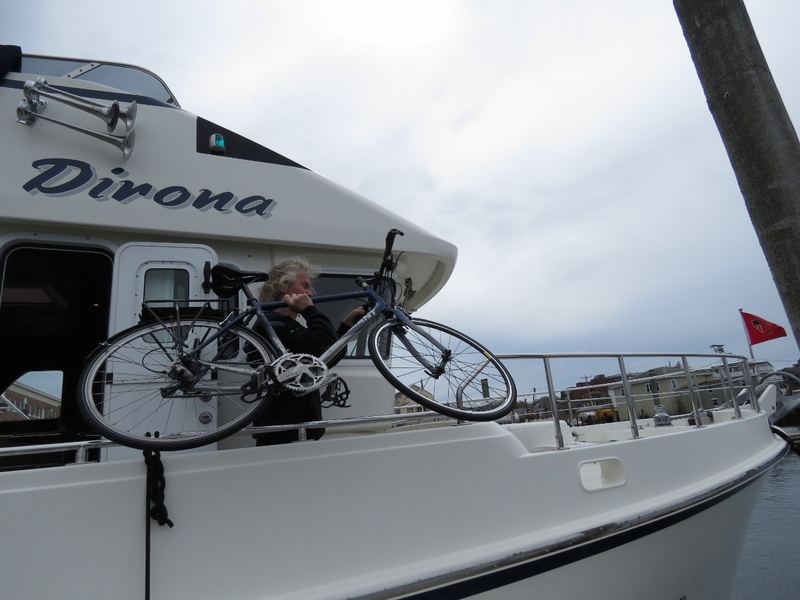 and i i meant to ask you this before but when you do the oil change at sea, as the whole thing was accomplished quickly, i’m wondering if there’s a maximum temperature (engine or oil) recommended….do you have to wait a bit for cool down before starting? As usual…loving the detail! On the storm plate material, I suspect they are plexiglass but it could be Lexan. To change the oil, I start the generator to carry the electrical load and then start and warm up the wing. When ready I put the wing in gear, bring up the revs, turn on the wing hydraulic pump, stet speed to 2,300 RPM and, if all looks right, shut down the main. It’ll take quite a wile for the oil to cool down so I change change the oil hot. With the filter at 190F, you need to move a bit more quickly or use thick gloves but it’s not hard either. The only real risk is that something will be spilled in rough seas so I prefer to do it when it’s reasonably calm. Our hydraulic configuration helps where either the wing or the main can run all the hydraulics so we have the active stabilizers on when the main is off and we are changing the oil.